From time to time our bodies need to rest, and cleanse from toxins and residues ingested every day. We know it is not that easy to eat healthy every day. This is why we offer the opportunity to cleanse and detox with our 3 phases detox programme. Each of the phases is totally independent and optional. During a few days, ideally a minimum of 7 days, avoid eating the following foods: processed foods, salt, sugar, caffeine, alcohol, gluten, soy, dairy and eggs. You can stop eating these foods on day 1, or could stop progressively. This phase has been designed to prepare the body for Phase 2. Our bodies are now ready to move further. Based on the fact that 5 light meals during the day are way much better than 3 heavy ones, the aim of the Cleansing phase is to replace breakfast with a Green Smoothie (355 ml), snacks with energy balls and ideally dinner with a soup. Lunch should be totally balanced with lean protein (grilled/steamed white fish or meat), green vegetables and 30% of carbs (such as brown rice, quinoa, etc.). The ideal length for this phase should be of a minimum of 5 days. Book your CLEANSING PROGRAMME here or order it at simplesmartdetoxplan@gmail.com and we will have it ready for you for pick-up. Our body is now ready to Detox. If the first 2 phases have been followed, the Detox should be easy. Offering our digestive system, also known as the second brain, a total rest by ingesting only liquid foods, will clear our body from all accumulated residues and allow it to absorb all the goodness from the fruits and vegetables included in the plan. The Detox programme can be undertaken for 1, 3 or 5 days. We offer both smoothie or juice detox plans. If it is done independently, one may feel a bit hungry on day 1, but this sensation will be totally gone from day 3, when one will feel stronger, lighter, and with a clearer mind. If hunger is too strong, eating a small bowl of brown rice, or half an avocado or even a handful of natural almonds will not alter the results of the programme. 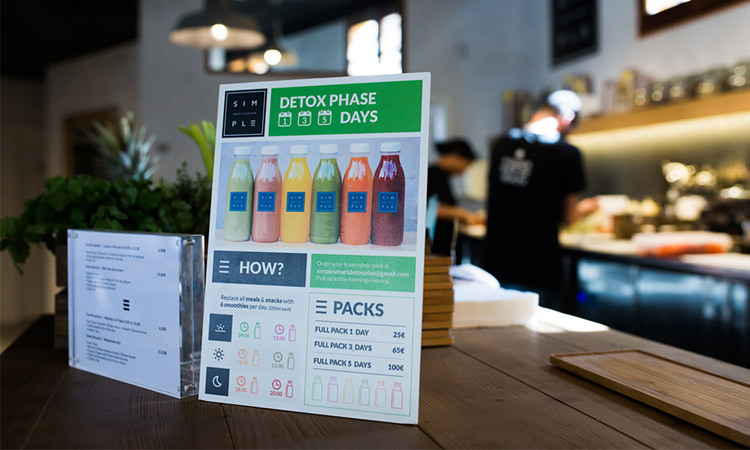 It is highly recommended carrying out a 1 day detox once in a while, ideally once a week, or even on a monthly basis to further benefit from the plan. Book your DETOX PROGRAMME here or order yours at simplesmartdetoxplan@gmail.com and we will have your pack ready for you.